Food For The Poor’s seventh annual Fine Wines & Hidden Treasures will be Thursday, Jan. 28, 2010, at The Ritz-Carlton Palm Beach. 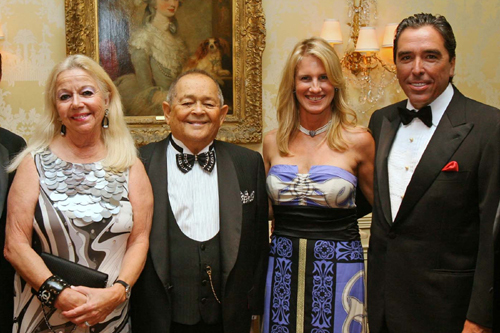 The event is chaired by distinguished Palm Beach philanthropists - Robert G. and Arlette Gordon (Honorary Chairpersons), and Andres and Cathie Fanjul (Ball Chairpersons). Food For The Poor’s gala will begin with a superb wine tasting reception sponsored by Transatlantic Wine & Spirits, Dreyfus Ashby & Co., and Southern Wine and Spirits of South Florida. The event wine sponsors will specially select fine wines for the reception and dinner to enhance each course. An evening of exceptional dining will feature culinary masterpieces prepared by the Ritz-Carlton’s Executive Chef, Ryan Artim and the following contributing chefs: Luke Forzano, Executive Sous Chef, Encore Wynn Las Vegas; Rey Eugenio, Executive Chef Partner, Roy’s Hawaiian Fusion Cuisine of Baltimore; Kenneth J. Gilbert, Capella Telluride/Inn at Lost Creek; and Mark Ainsworth, President/CEO, Pastry SmartLLC. An exclusive seven-day, six-night stay at Casa de Campo, Dominican Republic, one of the Caribbean’s most luxurious resorts will be the evening’s raffle prize. The winning ticket will be drawn at the event. Unique wine selections, jewelry and exotic escapes are among the additional varied silent and live auction prizes. The finale of the inspiring Fine Wines & Hidden Treasures weekend will be a champagne tailgate party, Sunday, Feb. 1, 2010 at the International Polo Club Palm Beach. The match will showcase some of the best and most talented polo players from around the world. Proceeds from Food For The Poor’s 2010 gala will continue to transform the lives of the destitute in Jamaica. The residents of Gordon’s Fishing Village in Bluefields, Jamaica, are prospering with housing, a school, sanitation, access to potable water and fish-processing facilities. Fishing villages include four fiberglass fishing boats with outboard motors, GPS equipment, fishing tackle and coolers, safety equipment, a gear shed with freezers and solar lighting. Since 2005, much-needed housing has been built in Jamaica, and these communities continue to be transformed by the proceeds raised at Food For The Poor’s annual Palm Beach galas. The three communities in Jamaica are rooted around the creation of sturdy housing and fishing villages. Because of the generosity of the Palm Beach community, homes will continue to be added to the approximately 100 already built. Frank Crystal & Company, International Polo Club Palm Beach, Southern Wine & Spirits of South Florida, TD Bank, and Transatlantic Wine & Spirits. Participating Wineries to include, Joseph Drouhin of France and Miguel Torres of Spain.